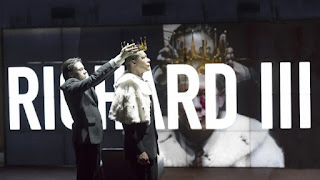 Kings of War is my second Shakespearean mash-up by Ivo van Hove (who directed Toneelgroep Amsterdam in performance of the adaptation by Bart van den Eynde and Peter van Kraaij). 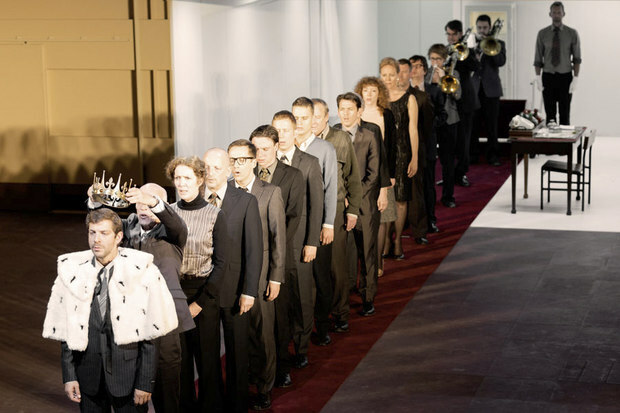 The first (Roman Tragedies in 2012: http://mollyismusing.blogspot.com/2012/11/friends-romans-dutch.html ) was longer, truer, better. This outing is more particularly edited, not unsuitable for the U.S. election season. In this production, van Hove and his cohorts for this translation by Rob Klinkenberg “adapted” Shakespeare’s Henry V, Henry VI Parts 1, 2 (not so much) and 3, and Richard III into one evening about kings and family feuds and wars and just plain murder. Or was it? 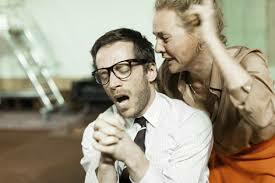 The first two hours and twenty minutes of the evening were engaging, imaginative, clever, even funny. The main events (political) of Henry V (“H5”) were covered, then on to Henry VI (“H6”) part 1, sliding over part 2, then clarifying the raison d’être for Richard III (“R3”) in part 3 of H6. We fell from some highflying places to a very poor R3 for the second half of the production, so bad I catnapped during the last 20 minutes or so and didn’t miss a thing. What happened? Why were van Hove, van den Eynde and van Kraaij able to, according to their own themes, comprehensibly condense four plays into less than 2 ½ hours, and make a hash-up in under two hours of the last one. For the first half, the setting was modern, easy to rearrange, and augmented with continuous video and supertitles showing us what was happening offstage. In Shakespeare, offstage usually means violence, and sometimes it does in Kings of War. We’d watch backstage action on video until those participants entered the playing area. At one point, what we saw were lots of sheep. (They were not really backstage.) The music of the first half was brass (by “Blindman”: Konstantin Koev, Charlotte van Passen, Daniel Quiles Cascant, and Daniel Ruibal Ortigueira), very exciting and fitting, especially with the inclusion of the marvelous contratenor Steve Dugardin. Each king was introduced on a red patterned carpet rolled onto the stage. We have already seen the procession, of course, on the video. The new king, Cardinals, right-hand men, queens, mothers and the like, all those people who have or wish to have the power behind the throne, would walk in step behind him (each him) as he walks to his coronation. It’s a nifty set up, making it perfectly clear whose reign it is, with the King’s name flashed on the supertitle just to make sure we all knew what’s what. Shakespeare generally puts the real violence offstage, therefore it appeared on video (by Tal Yardin) in this production. Some of it was rather harrowing, and York’s examination of Uncle Gloucester’s offstage corpse in H6 was ghastly and effective. Van Hove and his colleagues seemed most interested in the political machinations of the kings’ courts, courtiers, advisers, wives, so it was confusing but delightful that he retained the wooing scene between King Henry and Katharina toward the end of H5. · Robert de Hoog was excellent as a whiny Dauphin in H5, as the manipulative snake oil salesman Suffolk in H6, and charmingly broken as Clarence in R3. But the best, the star of the evening, was Chris Nietvelt. I’d seen her as Cleopatra (among others) in the Roman Tragedies, and here she played three roles: Montjoy, the French courier in H5, then Leonora, foolish and self-destructive wife to Gloucester in H6, and finally Elizabeth, wife then widow to Edward IV, mother to the two princes murdered in the Tower and to young Elizabeth, wanted by Richard for his third wife (lest you worry, eventually to marry Richmond, Henry VII). Ms. Nietvelt continues her fine characterizations and truthful performances that I learned to expect from her the last time I sat through many hours of Shakespeare in Dutch. There were some rather dull performances in single roles: Marieke Heebink as the Duchess of York in R3, when she was as shallow as her theatrical son: Hans Kesting as Richard III. Also far from stellar and merely scary was Janni Gosling as Margareta, queen then widow of Henry VI, lover of Suffolk, and theatrically Johnny-one-note from the moment we met her. While I’m naming names, design and lighting by Jan Versweyveld, music by Eric Sleichim (yay first half, boo second half); costumes by An D’Huys. In the second half, the set looked like the lobby of a middle class hotel. We saw that what had been the musicians’ gallery in the first half was populated with a “disc jockey” with no discs, just a machine to control the electronic sound, which produced irritating noise. But then, most of the second half was annoying. Hans Kesting enters as Richard with a birthmark on his face and a limp. His clothes are ill-tailored so he seems to be more physically inhibited than he is. Richard was drawn to a full length mirror onstage, and kept returning to it. Between that and the video filming him looking at himself, I had double vision with nausea. Halfway through, to top it off, for no reason at all, Richard takes off his clothes center stage to change into his not much different costume for his coronation. It took much longer than it deserved. There could have been ten minutes cut off the playing time. Surely there were other places to edit as well. This company uses the same designers and videographers and some of the same actors. Interestingly, one of the flaws of this modern styling and the microphones and the television and the video is the same problem the Roman Tragedies had in the same BAM Opera House back in 2012: that I often could not tell who on the stage was speaking (particularly when two of the younger male actors looked rather similar to one another). The miking of actors must be compensated for in the staging so we don’t wonder who’s speaking, what with all those sounds coming from the same place. I also noted that the first two plays of the Roman Tragedies (Coriolanus and Julius Caesar) were well edited and “mashed” but that the last play, Antony & Cleopatra, like the last play in Kings of War, Richard III, lasted too long, as if the editors got tired and just said, this will have to do. In any case, I’m glad I experienced this production, flaws and all, and will give the next Shakespearean mash-up from Toneelgroep Amsterdam a try. ~ Molly Matera, signing off to re-read Coriolanus to figure out how much the Red Bull Theater production cut.